Senior Softball Says: Game On! Senior Softball shows love of competition knows no age! One of my favorite sports events of the year is in Greater Lansing this weekend and no, its not the first game of the year for Spartan Football, although that&apos;s also fantastic. 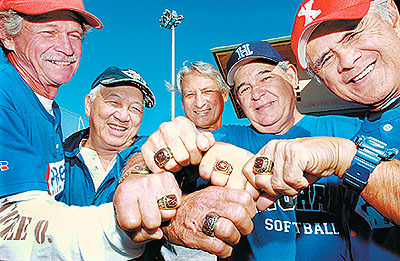 No, I&apos;m talking about the Senior Softball USA Northern Championships. Why is it my favorite? Because it always reminds me that passion for competition knows no age. That when you use it, you never lose it and that the field of play isa open for everyone. Now held in the Greater Lansing are for a number of years, this tournament brings together nearly 50 teams containing some of the best recreational softball players in the country that are 50-years-old and up. In some cases, way up. Do you think you could still field a hot grounder, or hit a line drive into the outfield at the ripe old age of 90?! I bet not, well these guys make it look easy. Yes indeed there will be some really incredible softball action going on this weekend, August 21-23 at the East Lansing Softball Complex and the Lake Alliance Softball Complex in Potterville. Games will be going on all day Friday, Saturday and Sunday and spectators are absolutely welcome. This is the Northern Championships and these teams have won a lot of hard-fought games to get to this point! Teams come from all over the country and this, in some cases, will be their first taste of Greater Lansing! Get out to these tournament sites to see some incredible softball action and give the qualifying teams a great big Greater Lansing welcome!